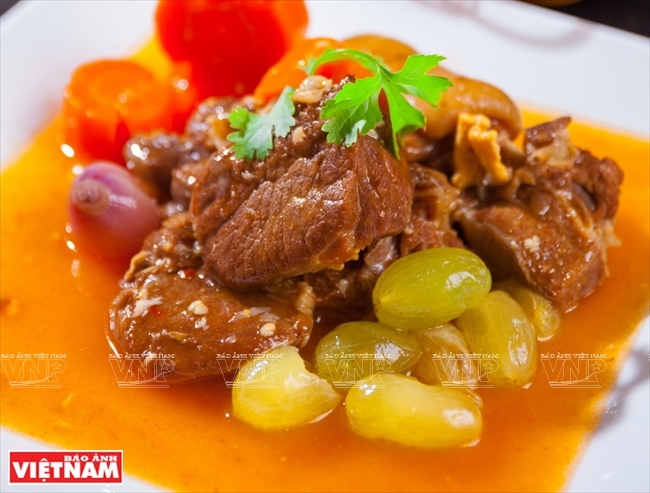 Two popular specialties of Ninh Thuan, lamb and grapes, are combined in a dish so scrumptious that one should not miss having it when visiting the southern central coastal province. Served with bread or fresh vermicelli, lamb stewed with grapes is a tender and rich dish, with the flavor of lamb broth mixed with the sweet and sour taste of ripe grapes. Begin by selecting the right cut of meat, which is lamb shoulder. Slice and season the meat for about 20 minutes. Peel the grapes and remove the seeds. Prepare carrot juice to add sweetness to the stew. Stew the marinated meat for an hour until the meat gets tender. Add carrot juice and grapes at just the right time so they don’t get mushy. You should try this popular dish at Hoa Thien Ly restaurant on Hai Thuong Lan Ong road in Phan Rang-Thap Cham in Ninh Thuan. with local red grapes to make the best lamb stewed with grapes.